This weekend, I’ll be finishing up Star Wars: Knights Of The Old Republic II—The Sith Lords, a 2004 game with a title so long that no one has ever said it out loud in its entirety. After the success of the original KOTOR, BioWare handed off development duties to Obsidian, who did a brilliant job crafting a thoughtful, dark take on the series. LucasArts rushed the Xbox version out the door, though, and besides the expected technical issues, a lot of game content got left behind. With the help of intrepid fans, the game can now be patched to run well on PC and with some of the deleted stuff restored. It’s a great game, possibly my favorite piece of Star Wars media this side of The Empire Strikes Back. The best part is Kreia. She’s a creepy, stern old woman, whom it’s implied is a former Sith lord, brought to life by English actress Sara Kestelman. She becomes your character’s twisted mentor, instructing you in the ways of The Force and her own philosophy: a pessimistic and borderline-Randian way of thinking focused on the importance of power and strife. Despite being kinda evil, she follows you no matter what side of The Force you land on, trying to sway you over to her side. Her cold charisma is magnetic, easily making her the game’s most captivating character—so captivating, that I found myself caring a lot about what she thought of my actions. Like, too much. It started because I was curious. Kreia clearly knows a lot more about the game’s story (past, present, and future) than she lets on, and I realized that by saying and doing things that meet her approval, we could build a rapport that leads to interesting backstory and lore to contextualize the game’s events. Somewhere around the third or fourth planet we visited, though, she started getting under my skin. I was nervous about picking the wrong response in one of our conversations. 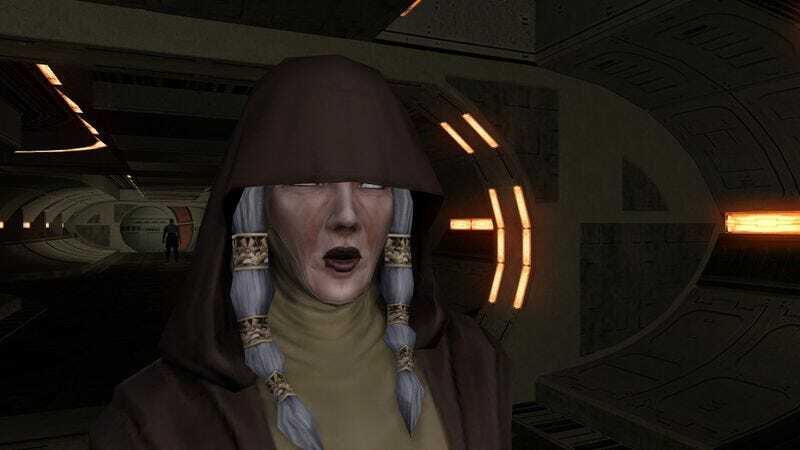 I don’t normally get this touchy about game characters, but when Kreia is disappointed in my character, I can’t help but feel like she’s disappointed in me—Jake. It’s a weird feeling. I’m not sure what it is about her, either. Is it because she’s so charismatic? Is there a weird Freudian thing going on that I’d really rather not think about? At any rate, I’m excited to finish KOTOR2. If I pick the right ending, maybe Kreia will finally say she’s proud of me, and we’ll go celebrate at the space Olive Garden.